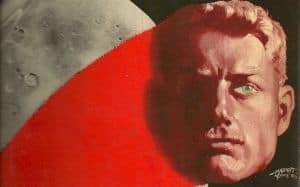 The Man Who Sold the Moon TV Series in the Works | Nerd Much? Bainframe, a new independent TV and film development and production company, has announced that they’ve acquired the rights to Robert A. Heinlein’s 1951 sci-fi novel The Man Who Sold the Moon, with the intention to develop the timely project for television. The Man Who Sold the Moon tells the story of Delos D. Harriman, a businessman on a mission to take humanity off-Earth. He starts his own private space company to colonize the moon, making himself responsible for taking the entire human race to its next evolutionary advancement. Heinlein was one of the best-selling authors ever in the sci-fi genre, selling over 100M copies of his sci-fi books, including Starship Troopers, The Moon is a Harsh Mistress, and Stranger in a Strange Land (some of which made it on our list of the 50 best sci-fi books). Obviously, the The Man Who Sold the Moon TV series is in its early developmental stage, so we don’t know what network is being looked at. This is likely to be one of many new acquisitions for the new studio, who wants to focus solely on acquiring and developing existing literary properties from science fiction’s most notable authors. Stay tuned to Nerd Much for more on the Man Who Sold the Moon TV series and other new upcoming sci-fi.